How much vit A to give? Thread: How much vit A to give? Received Repashy powdered Vit A finally. Mr Toad ( young western toad) who is recovering from serious MBD is still not eating by himself. Not sure how much vit A to give him? Suggestions appreciated. Re: How much vit A to give? Vitamin A like vitamin D is a fat soluble vitamin. In short this means that both can be overdosed. Repashy vitamin A supplement is effectively a retinol which the body converts into vitamin A. It’s recommended to be used only once a month as excessive retinol can be fatal in high doses as it builds up in the body. I use it myself but only once a month and not in conjunction with other supplements. I.e. I’ll supplement with repashy A and then use no supplements for a few days after. Thank you very much for your post! Will definitely use the Vit A with caution as you have suggested. Do you just dust a cricket with it? Yes. Dust the feeders lightly. Also it’s wise to gutload your crickets for a few days. I use fresh carrots and dandelion greens. Kale is especially good as well. A varied gutload diet results in a more nutritionally balanced prey item for your frog. Dan has given great advice on using vitamins and minerals to amphibians. I am a former amphibian keeper at the Omaha Zoo. We took care of many species of amphibians that are on the critically endangered list, including the Wyoming toad and the Puerto Rican crested toad. Vitamin A was used to prevent STS (short tongue syndrome) - where the toad has difficulty eating and getting around. Our protocol was to use liquid vitamin A and administered one drop weekly on the toad's back. I don't know how difficult it is to get the liquid form of vitamin A, but it sure makes it a lot easier. Good luck! Will ask the vet about Liquid vit A. Mr Toad ( young western toad) is recovering from serious MBD. Is getting ca and D3 dusted feeders every ither day and multivitamins on alternate days upon feeders. Still needing to be force fed. Walking more but has some bowing of his legs. Getting much stronger and determined to do what he wants ( gets out of water dish by himself, burrows a bit, etc). Still has difficulty using one front leg well but has improved markedly. Hope vit A will get him eating by himself. The picture I have was recommended by a very impressive vet and you don't dust or use any other supplements. This was one of two gut loading supplements she approved. I learned a lot these past few weeks and honestly even the Repashy vitamin A isn't good compared to this. There were studies done and this was found. It has made my animals health increase tremendously. It builds fat and muscle. If you are treating hypovitaminosis A, I found a treatment protocol that uses 1 unit of vitamin a per gram of weight your toad is. Since the gel caps are so concentrated compared to a ~50 gram or less toad, they recommended diluting in vegetable oil. This was given once daily for 14 days and reversed signs of hypo vit A in one referenced article by a herp vet that I found. I have actually started this protocol in my 2 American Toads that I suspect hypo A in. I am at day 4 now, and I will say they are more alert and active, I haven't seen a change in their ability to catch prey well with the tongue yet. In terms of how often you should supplement, the Repashy vit A recommends daily dusting, although I have read most people recommending alternating the multi vitamin with a calcium supplement and that is what I plan to do (prior I was only using calcium with D). There is another study looking at vitamin A in amphibians that found dusting vitamin A supplementation did not significantly increase vitamin A content of the liver post mortem after 30 days compared to topical administration with a product called Aquasol A which I have found a hard time finding on the internet. It was comparable to the amphibians that didn't get dusting, so I think an alternate day approach to dusting is probably safe at avoiding hyper vitaminosis, but hopefully enough to prevent a deficiency from occurring. I think gut loading is a smart thing to do, as well as varying the diet as much as possible. Hope your toad is doing well! Thank you for posting the link. It was a very informative article. The gut load Mazuri is actually intended to cover all dusting and supplementing. I am waiting for the vet to give me the study that was done on this but I can say from using it with my toads I have not needed to use anything else and I have noticed a tremendous difference. The color came back and it is more vibrant as well as the alertness and they have been growing a lot faster with this gut load. I used to use repashy and Rep Cal and a couple other things but ever since I started using this and this alone I have noticed a major difference. Once the study gets sent to me I can share it with everyone but I believe that it is a must need for all frogs and toads. I have noticed a difference in all of my amphibians since using it. 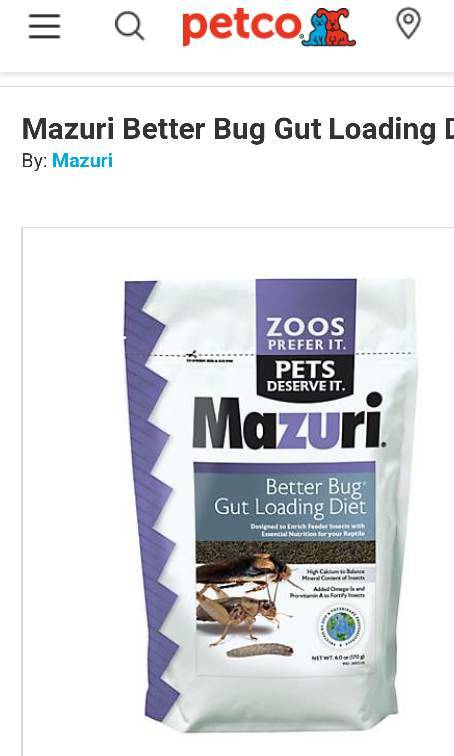 I like Mazuri products and am excited to get this gut load this week. If you are raising insects and not just keeping a few days prior to feed, is this product intended to be fed as a primary diet or mixed in with a primary feed? Can you give me a rough age?